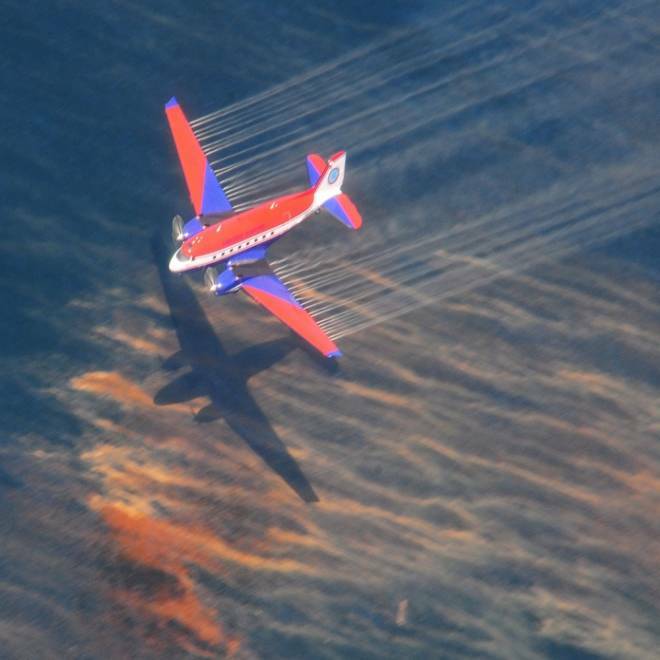 An aircraft releases chemical dispersant over the oil spill from the Deepwater Horizon, off the shore of Louisiana on May 5, 2010. During the 2010 Deepwater Horizon oil spill in the Gulf of Mexico, which dumped nearly 5 million barrels of crude into the water, responders applied some 1.8 million gallons of chemical dispersant to break up the oil slick. The chemicals, which were sprayed on the surface and pumped near the gushing pipe on the ocean floor, largely prevented the slick from saturating delicate coastal marshes, but they had their own environmental impact that scientists are only now beginning to understand. A study published Tuesday provides one possible piece to that puzzle, indicating that chemical dispersants of the type used in 2010 hurt microorganism populations that are a key link in the marine food chain, with dire implications for fish and larger sea animals. "Our study was interested in the tiny organisms that support the base of the food web," said Alice Ortmann, who led the study at Dauphin Island Sea Lab in Alabama. "These are the small things support all the big things in the ocean." The research conducted in a controlled lab setting showed that dispersants and dispersed oil "significantly reduced" the growth of phytoplankton and ciliates — essentially, fish food. It also showed that oil that was left alone — and thus degraded while floating on the water's surface — was found to cause no significant damage to these organisms. The study, published in the online science journal PLoS ONE, suggests one of the environmental trade-offs made in the disaster response. Dispersants are soap-like agents that break up oil slicks into smaller particles. Using them introduces some toxicity — albeit far less than oil, scientists agree. But in breaking up the oil, the dispersants can expose organisms in the water, while possible sparing those on the surface, like pelicans. At the time of the disaster response, the large volumes of dispersants being applied sparked accusations that BP — the owner of the Deepwater operation — was trying to hide the oil from view for public relations reasons as much as out of environmental considerations. "We are still reviewing the study, but the state can say that the use of dispersants in the volume and conditions under which it were applied were unprecedented," said Garrett Graves, chairman of the Coastal Protection and Restoration Authority of Louisiana. "We did raise objections to this application of dispersants during the spill, the unknown impact on our Gulf, and that we were being used as lab rats." That impact remains unknown, Ortmann said, because these findings were based on lab results. "This is what we saw in our incubations," she said. "What happens out in the ocean we don’t really know yet." Independent studies like this one will supplement a large, long-term effort called the Natural Resource Damage Assessment administered by federal and state trustees. The assessment is an attempt to account for all the damage caused by the oil spill to the environment and human activities that depend on it. "We’ll come up with a tab to say 'BP, you are responsible for this injury'," said Tim Zink, spokesman for NOAA, one of the federal agencies leading the effort. "The way they pay it back is through restoration projects" for shorelines, land protection and dunes and efforts to restore turtle or bird populations. About $60 million has been disbursed for initial restoration projects, even as the effort to assess the damage continues. A separate investigation by NOAA is looking into a dramatic spike in dolphin deaths — more than 720 from the time of the explosion in April 2010 to July 29 this year. "Oil is being investigated as one of the key factors," said Tim Zink, spokesman for NOAA’s damage assessment and remediation efforts. Meantime, studies of live dolphin populations that were in contact with the oil in the Gulf have turned up troubling findings, including pulmonary issues, chronic low weight, anemia and low levels of hormones that could affect the animals' ability to survive, Zink said. Another recent study by a team of researchers published in the Proceedings of the National Academy of Sciences in March has documented damage to coral in the vicinity of the broken well at a depth of about 4,000 feet, an ecosystem that normally would not be affected by oil spills. "The sheer magnitude of the Deepwater Horizon oil spill and its release at depth make it very different from a tanker running aground and spilling its contents," said Haverford College chemistry professor Helen White, lead author of the study, who was cited in a report on the Penn State website. The Deepwater Horizon oil spill, the largest in U.S. history, occurred in one of the continent's most productive ecosystems. It dwarfed the 11 million gallons spilled by the Exxon Valdez tanker in Prince William Sound in 1989. "Fully understanding the short and long-term impacts of the explosion, oil and natural gas released, dispersants, and other factors is likely to take several years," said Graves.